to design appearance of parking lots. Parking lots are areas for car parking equipped with gates and payment terminals. By the request of Moscow Parking state enterprise, information boards and signs for Moscow parking lots were developed at the studio. 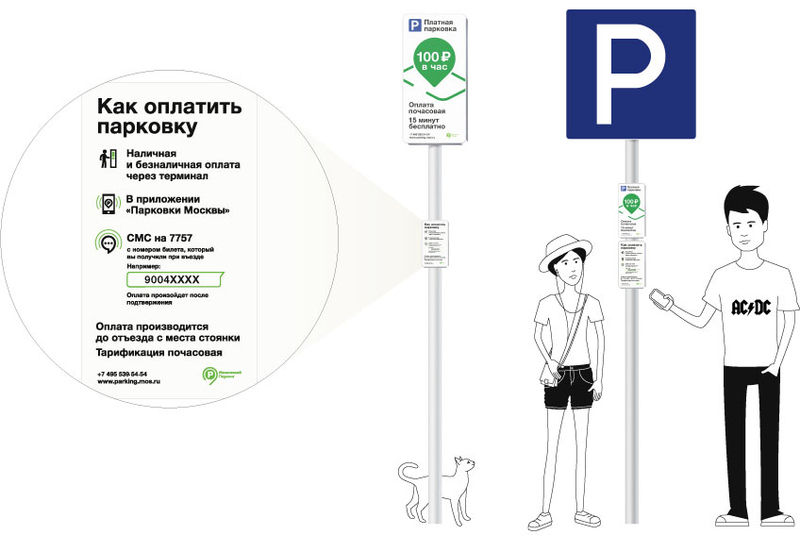 Information boards for parking lots are designed in the same style as street parking signs. Together they create a single system: they have same sizes (large and small), the information is presented in a familiar sequence that is easy to read while their placement takes into consideration people of various height. The boards are supplemented by signs helping drivers better navigate the parking lot space. Parking lot users often suffer from traffic jams at the exit gates created by drivers who forgot to pay for parking. Signs reminding drivers to pay before exiting were created to solve the problem. Parking space markings include text reminding to pay for parking. The parking terminal canopy is decorated with the bright corporate pattern which makes it visible from a distance. Pavement markings complement the signs and improve navigation at the parking lot.